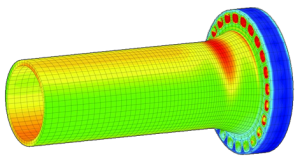 W. Maass (UK) Ltd have an in-house design department to provide support to Customers requiring design or stress analysis work ranging from formulae based flange design calculations to Finite Element Analysis. Design work can be provided as a standalone service or to support a complete project supply. Contact us for more information. 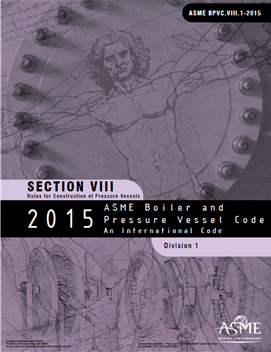 Flange design calculations to ASME VIII Div 1 Appendix 2 are the first option for design analysis and verification. They can be used for standard flange types such as Weld Necks or modified with other proprietary calculations to analyse special flanges such as Swivels and Anchors. Formulae based calculations are the quickest and most cost effective method of flange design verification. They provide a general understanding of performance but can provide conservative results. 2D Axis-Symmetric FEA is a more accurate and intricate method of design verification compared to formulae based calculations. It allows greater insight into the fine detail of flange design, in particular greater detail of seal integrity. It’s also less conservative than calculation method. Analysis is performed in accordance with ASME VIII Div 2 Part 5, considering linear or non-linear stress analysis, fatigue analysis and HISC analysis. 2D Axis-Symmetric FEA is a quick and cost effective method of performing design analysis but it’s slightly compromised because external bending moment has to be considered as an equivalent axial force, torque and shear forces can’t be considered and bolt holes can’t be accurately modelled. 3D FEA is the most accurate and informative method of design verification and provides the greatest accuracy. Analysis time can be long, especially if a complete joint is analysed using contact faces. Analysis is performed in accordance with ASME VIII Div 2 Part 5, considering linear or non-linear stress analysis, fatigue analysis and HISC analysis. 3D FEA is most suited to non-linear analysis as the model can realistically simulate stress re-distribution at locations of yield. If you require our in house design services please contact us via Phone: 01744 453393, Email: sales@w-maass.co.uk or click here for our contact us page.